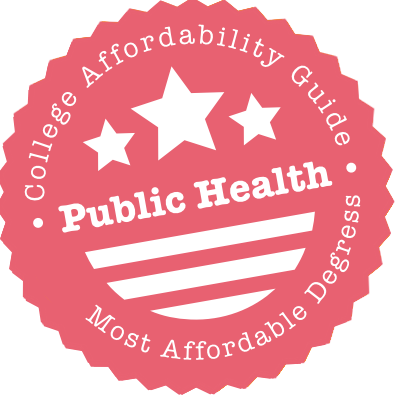 Scroll down to see the most affordable public health degrees, as well as info on the different types of public health degrees and public health program accreditation. UC Irvine's Program in Public Health offers a Bachelor of Science in Public Health Sciences and a Bachelor of Arts in Public Health Policy. Students also have the option of obtaining a Global Health Certificate from the program. There is a Master of Public Health (MPH) program offered with three areas of emphasis: Environmental Health, Epidemiology, and Sociocultural Diversity and Health. Students who choose to pursue the Ph.D. in Public Health can specialize in Global Health or Disease Prevention. The Program in Public Health at UC Irvine has a Ph.D. in Environmental Health Sciences that is a joint program with the School of Medicine. This program has two tracks - Toxicology and Exposure Science, and Risk Assessment. The Department of Applied Human Sciences at the University of Minnesota-Duluth offers a Bachelor of Applied Science in Public Health Education and Promotion, as well as a public health and education minor. The B.A.S. in Public Health Education and Promotion requires 96 to 108 major credits and offers concentrations in community health education or school health education. Students in the community health concentration complete 33 concentration credits in subjects like environmental health, community health methods, and health education and promotion, as well as a health education internship. The school health concentration requires 44 concentration credits in subjects like designing learning environments, secondary school special education, teaching indigineous students and adolescent development, as well as a three to twelve-credit student teaching experience. The Texas A&M University School of Public Health offers a Bachelor of Science in Public Health, a Master of Public Health, and a Doctor of Public Health. The goal of the public health program is to improve the quality of life for communities, families, and individuals. Students who are admitted to the BSPH program must maintain a cumulative GPA of 3.0 or higher within the coursework at Texas A&M. Students in this program have assisted in programs/centers of faculty, served as interns throughout Texas, and conducted epidemiologic studies. Students in this program will take such courses as Foundations of Public Health, Social Context of Public Health, Biological Bases of Public Health, and Native Approach to Public Health. The Gillings School of Global Public Health at UNC Chapel Hill offers a Bachelor of Science in Public Health. The school also has a Master of Public Health (MPH) program as well as a Master of Science in Public Health (MSPH) program. Through a variety of joint degree programs, students enrolled in the MPH or MSPH program can concurrently earn a second degree in the following UNC schools and colleges: Medicine, Pharmacy, Business Administration, City and Regional Planning, Information Science, Library Science, Law, and Social Work. The school offers a Doctor of Philosophy (PhD) program and a Doctor of Public Health (DrPH) program. The Gillings School of Global Public Health is certified by the Council on Education for Public Health (CEPH). The UCLA Fielding School of Public Health offers two types of degree programs - Professional Degrees (Master of Public Health, MPH and Doctor of Public Health, DrPH) and Academic Degrees (Master of Science, MS and Doctor of Philosophy, PhD). These degrees are conferred through the school's five departments: Biostatistics, Community Health Services, Environmental Health Services, Epidemiology, and Health Policy and Management. In addition, Fielding School offers eight concurrent degree programs: MPH/Asian American Studies MA, MPH/Islamic Studies MA, MPH/Law JD, MPH/Management MBA, MPH/Public Policy MPP, MPH/social Welfare MSW, MPH/Urban Planning MA, and MPH/African Studies MA. Students can also complete their MPH and earn an MD degree in five years through an articulated degree program with the School of Medicine. The School of Public Health at UIC offers a Bachelor of Arts in Public Health and four master's degrees: Master in Public Health (MPH), Master of Science in Public Health (MSPH), Master of Science in Clinical and Translational Science (MSCTS), and Master in Health Administration (MHA). The school has two doctoral degrees: Doctor in Public Health (DrPH) and a Doctor of Philosophy in public health sciences (PhD). The School of Public Health at UIC has a Peace Corps Master's International program. Students admitted to this program gain global health experience through the Peace Corps as they earn credits toward their Master in Public Health degree. The school also has 13 joint degree programs and 8 online certificate programs. In September 2013, the Department of Family Medicine and Public Health (FMPH) at UC San Diego began offering a Bachelor of Science in Public Health program. This is the first undergraduate degree offered by the School of Medicine. The curriculum includes coursework in the U.S. health care system, social inequality and public policy, economics of health consumers, and policy analysis. Although students can craft an individual plan of study, there is currently a track for pre-medical students as well as tracks in epidemiology and biostatistics, social and behavioral sciences and public health, and health policy. UC San Diego offers a Doctor of Philosophy in Public Health degree jointly with San Diego State University with concentrations in epidemiology, health behavior, and global health. The School of Public Health at the University of Minnesota Twin Cities has the following graduate programs: Master of Public Health (MPH), Master of Healthcare Administration (MHA), Master of Science (MS), and Doctor of Philosophy (PhD). Students enrolled at the school's MS and PhD programs can choose from four areas of concentrations: Biostatistics, Clinical Research, Environmental Health, and Health Services Research, Policy & Administration. The school has joint degree programs with the following UM schools and colleges: Business Administration, Dentistry, Law, Medicine, Pharmacy, Public Policy, Social Work, and Veterinary Medicine. UM's School of Public Health is accredited by the Council on Education for Public Health (CEPH). The School of Public Health at UC Berkeley offers a Bachelor of Arts in Public Health as well as a Master of Public Health in the following areas of study: Biostatistics, Environmental Health Sciences, Epidemiology, Epidemiology/Biostatistics, Health & Social Behavior, Health Policy & Management, Infectious Diseases & Vaccinology, Interdisciplinary, Maternal & Child Health, and Public Health Nutrition. The school jointly administers a Master of Arts (MA) degree in Biostatistics with the College of Letters & Science. There are four Master of Science programs: MS in Epidemiology, MS in Environmental Health Sciences, MS in Global Health and Environment, and a joint MS in Health & Medical Sciences and MD degree. The school also offers Doctor of Public Health (DrPH) and Doctor of Philosophy (PhD) degrees. UC Davis offers a full-time Master of Public Health (MPH) program that is accredited by the Council on Education for Public Health (CEPH). Students accepted to the program can earn their degree in general public health or in epidemiology. The program can typically be completed within two years. The curriculum includes coursework in biostatistics, health services administration, environmental and occupational health, social and behavioral science, and epidemiology. All students are required to complete a practicum in order to graduate. A dual degree program is available for students who wish to earn their MPH concurrently with the MD degree. Qualified MPH students have access to research and teaching assistantships that provide a stipend and full or partial remission of in-state tuition fees. Appalachian State University's Department of Health and Exercise Science offers a Bachelor of Science in Health Promotion, as well as an undergraduate minor in health promotion. Students completing the BS in Health Promotion are eligible to earn two certifications upon graduation: the Certified Health Education Specialist (CHES) certification from the National Commission for Health Education Credentialing Inc. and the Health/Fitness Instructor certification from the American College of Sports Medicine. The school also offers an online Bachelor of Science in Health Promotion, which is a 62 hour degree completion program designed for students with at least 30 transferable credits. The online program is a part-time, year-round program that takes 10 semesters to complete and includes a business minor and a 320 hour internship. The School of Public Health and Health Sciences at the University of Massachusetts Amherst is the only CEPH-accredited, state-funded school of public health in New England. It offers a Bachelor of Science degree in the following areas: Communication Disorders, Kinesiology, Nutrition, and Public Health Sciences. In addition, the school offers a Master of Public Health (MPH) degree, a Master of Arts (MA) degree in Communication Disorders, Master of Science (MS) degrees in Kinesiology, Nutrition and Public Health, and Doctor of Philosophy (PhD) degrees in Audiology, Kinesiology and Public Health. A dual degree (Master of Public Policy and Administration, MPPA and Master of Public Health, MPH) is offered through a collaboration with the Center for Public Policy and Administration. St. Cloud State University's Department of Kinesiology offers a Bachelor of Science in Community Health and an undergraduate community health minor. The B.S. in Community Health requires 53 credits of major coursework, including 37 credits of core courses in subjects like nutrition, public health, personal health, international health, epidemiology and human sexuality. Students are also required to complete a six-credit internship in a community health setting. After completing the program, students are encouraged to take the Certified Health Education Specialist (CHES) certification test. The community health minor requires 25 credits of coursework, including 19 credits of core courses and six credits of electives. Community health students can also participate in student organizations like the Student Health Action and Advisory Council (SHAAC). At CSU Long Beach, the Master of Public Health (MPH) program is offered through the Department of Health Science at the College of Health and Human Services (CHHS). The MPH program has been accredited by the Council on Education for Public Health (CEPH) since 1983. It received its most recent seven-year accreditation in 2015. Students accepted to the program follow a curriculum that includes courses such as advanced community health statistics, administrative relationships in health education programs, curriculum development in health education, and health promotion and risk reduction. In addition to CHHS assistantships and scholarships, MPH students can apply for the following scholarship opportunities: Gaines Award, Pollack Award, and the Forouzesh Scholarship. Award. Amounts for these scholarships vary. Western Illinois University's BS in Public Health comes with optional emphases in Community Health Education as well as Environmental and Occupational Safety. The MS in Health Sciences, meanwhile, has a Public Health option. Majors in the Department of Health Sciences compete for several awards, including the Zorn Scholarship, Taylor Memorial Scholarship and Lowell Award for Undergraduate Professionalism in Health Sciences. Returning Peace Corps volunteers interested in the graduate program should apply for the school's Peace Corps Coverdell Fellows Program. The two-year program includes a paid 11-month internship focused on community and economic development as well as a tuition waiver. At Winona State University, the Department of Health, Exercise, and Rehabilitative Sciences (HERS) is under the College of Nursing and Health Sciences. The department offers a Bachelor of Science in Public Health. Students with a major in Public Health can choose to specialize in two areas - Community Health Specialist or Epidemiology. The program prepares students for a broad range of careers including jobs in health promotion, community development, epidemiology, and public health research. The Epidemiology focus is designed for students interested in pursuing a graduate school degree. Students in the Master of Public Health program at the University at Albany get an interdisciplinary background in the field as they prepare to tackle public health problems from a variety of angles. Each master's candidate chooses an area of concentration: Biomedical Sciences, Biostatistics, Environmental Health Sciences, Epidemiology, Health Policy and Management, or Social Behavior and Community Health. The master's program also requires candidates to perform an internship. The university also offers a completely online part-time master's program leading to a Master of Public Health in Public Health Practice. Online students must complete 51 credits, an internship, and a capstone project. The Doctor of Public Health program is for experienced individuals who want leadership roles in public health practice. Stony Brook University's Program in Public Health offers a Master of Public Health degree, four undergraduate public health combined degree programs and five graduate public health combined degree programs. The Master of Public Health is a 54-credit program offered in three concentrations: community health, health analytics and health policy and management. Courses are provided in five key areas of public health: biostatistics, environmental health, epidemiology, health policy and management, and the social and behavioral sciences. Combined undergraduate MPH degree programs include Bachelor of Science degrees in applied mathematics and statistics and pharmacology and Bachelor of Art degrees in earth and space sciences and women's studies. Combined MPH graduate degrees are offered in the fields of business administration, dentistry, nutrition, medicine and public policy. The College of Public Health and Health Professions (CPHHP) at the University of Florida offers a Bachelor of Health Science degree with a Pre-Public Health track, which provides the educational foundation needed for advanced studies in public health or a related field. The college also offers a combined Bachelor's/Master of Public Health (MPH) program. A Traditional MPH (48 credits) as well as an Accelerated MPH (42 credits) are also offered. In addition, the college has an Online MPH program with two areas of concentrations - Public Health Practice and Social Behavioral Science. There are joint programs available in Law (JD/MPH), Medicine (MD/MPH), Pharmacy (PharmD/MPH) and Veterinary Medicine (DVM/MPH). CPHHP offers collaborative programs with doctoral level graduate degrees as well (PhD/MPH). The Master of Public Health (MPH) program offered UICU's College of Applied Health Sciences is accredited by the Council on Education for Public Health (CEPH). The MPH program provides training and instruction in the following core areas: health policy and management, epidemiology, biostatistics, environmental health, and health behavior and promotion. Students are required to complete a capstone project in order to graduate. Qualified MPH students can concurrently pursue a Doctor of Philosophy degree in community health, food science and nutrition, human and community development, kinesiology, nutritional science, or social work. A joint MPH/MUP (Master of Urban Planning) degree is also available. A five-year BS-MPH program is available only to UIUC students pursuing a degree in community health, interdisciplinary health, or kinesiology. The University of Iowa has the state's only accredited public health programs. Undergrads can combine a BA or BS with a Master of Public Health (MPH) and complete both in just five years. Undergrads should strongly consider applying - the MPH was ranked 17th-best in the nation by U.S. News and World Report in 2018. In addition to providing grants and assistantships, the College of Public Health funds professional development and out-of-state or international practicums for grad students. New undergrads can also receive funding. The pinnacle is the College of Public Health Dean's Scholarship, a $5,000 renewable grant for extraordinary incoming freshmen. The college's two renewable Diversity Scholarships, worth $2,000 each, are awarded partly based on financial need. Students working toward a Master of Public Health at North Dakota State University have a choice of four specializations: American Indian public health, public health in clinical systems, health promotion, or management of infectious diseases. Candidates take 18 core credits, complete a master's paper, and perform a practicum or internship in addition to taking specialization courses. NDSU has the only MPH in the U.S. that prepares grads to work with Native American populations, and a graduate certificate in American Indian Public Health is also available. Other graduate certificates cover general public health, health systems leadership, and infection prevention. MPH students are eligible for a variety of scholarships, such as the Miller Scholarship for students in the clinical systems track. Michigan State University offers a Master of Public Health, as well as the following dual degrees: Doctor of Osteopathic Medicine/Master of Public Health, Medical Doctor/Master of Public Health, Doctor of Veterinary Medicine/ Master of Public Health, MS in Food Safety/Master of Public Health, Master of Social Work/Master of Public Health and PhD in Social Work/Master of Public Health. All classes for the Master of Public Health are available online and the program can be completed on a full or part-time basis within a maximum of five years. MPH students are required to complete a 240 hour practicum or internship and a capstone paper. Undergraduate students have the option to dual enroll as both a graduate and undergraduate student to begin their MPH coursework early. The Department of Health Science at Minnesota State University-Mankato offers a Bachelor of Science and a Master of Science in Community Health Education, as well as a post-baccalaureate certificate program in public health education. The B.S. in Community Health Education requires 44 credits of major core coursework in subjects like health communication, chronic and infectious diseases, epidemiology, biostatistics and human anatomy. Core courses also include an internship in health education and a senior seminar. The post-baccalaureate certificate in public health education requires 21 credits of coursework, all of which can be completed online. The M.S. in Community Health Education is offered in two tracks of study: a thesis track (30 credits) and an alternative paper track (34 credits). At UNC Greensboro, the School of Health and Human Sciences houses the Department of Public Health. The school offers a Bachelor of Science in Public Health with a concentration in Community Health Education. After completing this program, students are eligible to be credentialed as Certified Health Education Specialists. The school also has a Master of Public Health (MPH) program, which is certified by the Council on Education for Public Health (CEPH). The school's Ph.D. program in Community Health Education focuses on community-engaged research in public health and health education. The School of Public Administration at the University of Nebraska-Omaha offers a Bachelor of Science in Emergency Management with a concentration in public health. Additionally, the University of Nebraska Medical Center offers a Master of Public Health program. The B.S. program requires 60 credits of public health courses in subjects like community health, epidemiology, school health programs, health literacy and public health informatics. The Master of Public Health is a 45-credit program with nine concentrations, including concentrations in biostatistics, epidemiology, health policy, health promotion and public health administration. Students can also earn dual master degrees in public health and eight subjects, including social work, business administration, pharmacy, physician assistant studies and medicine. Students interested in public health can earn a bachelor or master's degree in community health at SUNY Cortland. Undergraduates in the major can prepare for jobs in health or for advanced study. Community health majors select an area of concentration: allied health, college health promotion and prevention, environmental health, health care administration and planning, health communication, international health, or wellness/health promotion. Undergrads perform a full semester of fieldwork. The Master of Science in Community Health programs covers research methods, assessment and evaluation of programs, applied epidemiology, and practices in community health education. Master's candidates do a capstone project where they work with a community health agency to address a health issue in depth. Some master's classes are offered online. The two-year Master of Public Health (MPH) program offered at the Department of Health Science at the Cal State Fullerton has CEPH accreditation (Council on Education for Public Health). The program has three tracks - health promotion and disease prevention, environmental and occupational health and safety, and gerontological health. The curriculum includes coursework in advanced methods in epidemiology, statistical methods in kinesiology and health science, environmental health, and public health administration. Students are required to complete 240 hours of internship and can choose to write a thesis or take a comprehensive exam as their culminating experience. As part of the College of Health and Human Development, MPA students can apply for the College of Health and Human Development Scholarship ($500). The Department of Health, Recreation and Human Performance at Brigham Young University- Idaho offers a BS in Health Science with concentrations in public health and health promotion. The Public Health major is offered in three emphasis areas: public health, occupational safety and health, and community and work site wellness. This degree prepares students to take the Certified Health Education Specialist (CHES) examination offered through the National Committee on Health Education Credentialing, Inc. Similarly, the Health Promotion major prepares students for careers as community health educators, health promotion specialists, work site wellness specialists, health counselors, wellness coaches or lifestyle training specialists by preparing them to take the Certified Health Education Specialist (CHES) examination. The School of Urban Public Health at Hunter College offers a variety of programs. Undergraduate degrees include a Bachelor of Science in Community Health and a Bachelor of Science in Nutrition and Food Science. The accelerated B.S./M.S. in Nutrition program is open to undergrads in the third year of the Nutrition and Food Science program. The M.S. in Nutrition also prepares students for the Registered Dietician credential. The Master of Public Health program has specializations in community public health, epidemiology and biostatistics, public health policy and management, or nutrition. The M.S. program also has a specialization in environmental and occupational sciences. The Doctor of Public Health program offers similar specializations and is delivered with the CUNY Graduate Center. The School of Public Health at West Virginia University is the first and only public health institution in the state. The school's Master of Public Health (MPH) program is certified by the Council on Education for Public Health (CEPH). It offers the five core disciplines in public health: Biostatistics, Epidemiology, Health Policy, Management & Leadership, Occupational & Environmental Health Sciences, and Social & Behavioral Sciences. Students also have the option of pursuing a Master of Science in Biostatistics. There are three doctoral programs: PhD in Epidemiology, PhD in Occupational & Environmental Health Sciences, and a PhD in Social & Behavioral Sciences. The school also offers an Applied Biostatistics Certificate. The Department of Public Health Sciences at UNCC's College of Health and Human Services has a Bachelor of Science in Public Health (BSPH) program. The department offers a Master of Health Administration (MSHA) program that is accredited by the Commission on Accreditation of Healthcare Management Education (CAHME). There is also a Master of Science in Public Health (MSPH) offered. The school's baccalaureate and master's degree programs are accredited by the Council on Education for Public Health (CEPH). The department also offers a Doctor of Philosophy (Ph.D.) in Public Health Sciences, as well as two Graduate Certificates - in Community Health and in Public Health Core Concepts. The Public Health Department at Oklahoma State University offers a Master of Public Health degree and a public health certificate. The Master of Public Health degree is a flexible, 42-credit program with a social/behavioral public health focus and no additional concentrations. The degree can be completed through full or part-time study by taking a combination of in-person, hybrid and online courses. Most full-time students complete the program in two years, but it can be completed in a maximum of four-years. There are also several MPH dual degree programs available, including a Doctor of Osteopathic Medicine/Master of Public Health degree, a Doctor of Veterinary Medicine/Master of Public Health degree and a Master of Science in Dietetics/Master of Public Health degree. The UGA College of Public Health, founded in 2005, is accredited by the Council on Education for Public Health (CEPH). It is one of only 41 colleges of public health in the country to receive this accreditation and one of two in Georgia. The college offers two undergraduate degrees - BS Environmental Health and BS Health Promotion. There are four master's degree programs: Master of Public Health (MPH), Master of Science in Biostatistics, Master of Science in Environmental Health (MSEH) and Master of Science in Toxicology. The college has the following doctoral degree programs: Doctor of Public Health (DrPH), Ph.D. in Biostatistics, Ph.D. in Environmental Health Science, Ph.D. in Epidemiology, Ph.D. in Health Promotion and Behavior, and a Ph.D. in Toxicology. Through its Department of Health and Nutrition Sciences, Brooklyn College offers a Master of Public Health in Community Health and a Master of Art in Community Health Education. The MPH in Community Health is accredited by the Council on Education for Public Health and is offered in two concentrations: general public health and health care policy and administration. Program classes are offered in the evening at both the Brooklyn and Manhattan campuses. The MA in Community Health also has two concentrations: community health education and thanatology. The community health education concentration prepares students to create, implement and evaluate programs and activities that enhance community health, while the thanatology concentration provides students with knowledge in the areas of death, dying and bereavement. The School of Public Health at the University of North Texas offers a Master of Health Administration, a Master of Public Health, a Doctor of Philosophy in Public Health Sciences, and a Doctor of Public Health. The goal of these programs is to efficiently prepare students to become effective public health professionals. Students who are interested in pursuing a degree in public health may concentrate in biostatistics, environmental & occupational health sciences, health management and policy, maternal and child health, epidemiology, and community health. The Master of Public Health Professional Option and the MPH in Health Management & Policy are offered entirely online as well. CSUN offers a Bachelor of Science in Public Health degree that prepares students to implement and evaluate health and human services programs targeting different populations in diverse settings. The curriculum includes coursework in human physiology, health behavior, community health action, and computer applications in health sciences. There is also a Master of Science in Public Health degree available. Students accepted to this program can choose a concentration in community health education or in applied epidemiology. The MS in Public Health program is accredited by the Council on Education for Public Health (CEPH). Graduate students can apply for the College of HHD's United States Department of Education CAMINO Scholarship Award ($1,000). Undergraduates are considered for the Holly Hunt Public Health Education Scholarship ($500). The University at Buffalo offers a Master of Public Health that focuses on analyzing the determinants of health behavior, and designing, implementing, and evaluating evidence-based interventions. Graduates will be prepared to work for a government health agency, health care delivery system, or nonprofit agency. The M.P.H. with a concentration in Community Health and Health Behavior is a 46-credit program full-time students can complete in four semesters. UB offers a one-year accelerated M.P.H. for qualified students who have relevant public health work experience and an academic background in the health sciences. UB also has combined programs that allow students to earn the M.P.H. and a professional degree, including Doctor of Medicine, Master of Social Work, and Doctor of Pharmacy. Indiana University-Purdue University-Indianapolis's School of Public Health offers a Bachelor of Science in Public Health (BSPH), a Master of Public Health (MPH) and an accelerated BSPH/MPH program. The Bachelor of Science in Public Health is offered in two majors: environmental health science and community health. The accelerated BSPH/MPH program is a five-year program designed for freshmen students accepted into the Honors College or students who have at least 60 credits hours and a 3.5 cumulative GPA. The Master of Public Health is a flexible program that can be completed through full or part-time study. Both daytime and evening classes are offered, as are online and hybrid classes. Available concentrations include epidemiology, environmental health, health policy and management, social and behavioral sciences and biostatistics. The University of Southern Maine's Muskie School of Public Service offers a Master of Public Health degree, as well as a graduate certificate in public health. Students pursuing the Master of Public Health can choose from a general concentration or a concentration in health management. Students in both concentrations are required to complete 24 credits of core coursework, including a capstone requirement and a field experience. Students in the general concentration are required to complete 21 credits of electives, while students in the health management concentration are required to complete 20 credits of concentration courses and three credits of electives. The public health certificate requires 15 credits of coursework which can be applied to the Master of Public Health degree if a student is admitted into the program. Missouri Southern State University offers a Bachelor of Science in Environmental Health that is accredited by the National Environmental Health Science and Protection Accreditation Council (EHAC) and is one of only 30 accredited programs in the United States. The B.S. in Environmental Health requires 45 major credits and can be completed on-campus or online. Students in the program are required to complete a two-credit environmental health internship. As a result of the program's EHAC accreditation, students in the program are eligible for internships and jobs with the U.S. Public Health Service, for Environmental Health Officer positions with military and public health institutions, and to take the Missouri Certified Environmental Health Specialist Exam. An environmental health and safety minor is also available, which requires a minimum of 18 credits. Through its School of Public Health, Rutgers University offers a Bachelor of Arts/Master of Public Health (BA/MPH) degree, a Bachelor of Science/Master of Public Health (BS/MPH) degree, a Doctor of Public Health, as well as several public health dual degrees. The Master of Public Health is a 45-credit degree program that offers concentrations in biostatistics, environmental and occupational health, epidemiology, health education and behavioral science and health systems and policy for students on the New Brunswick campus. Dual degree programs are available in 14 disciplines, including a Medical Doctor/Master of Public Health degree, a Master of Business Administration/Master of Public Health degree, a Juris Doctor/ Master of Public Health degree and a Doctor of Psychology/Master of Public Health degree. The Bachelor of Science in Public Health at SDSU provides students with opportunities to study diverse disciplines that include epidemiology, occupational health, behavioral science, environmental health, and health services administration. Master of Science and Doctor of Philosophy programs in public health are available. The MPH program offers concentrations in biometry, environmental health, epidemiology, health management and policy, and health promotion and behavioral sciences. Concurrent degree options are offered in public health and social work (MPH/MSW) and in public health and Latin American studies (MPH/MA). SDSU's public health programs are accredited by CEPH (Council on Education for Public health) and CAHME (Commission on Accreditation of Healthcare Management Education). Students can apply for the Sharp Healthcare Health and Human Services Scholarship ($1,500). The College of Health and Social Sciences at San Francisco State University offers Bachelor of Science in Health Education and Master of Public Health in Community Health Education degrees that are accredited by the Council on Education for Public Health (CEPH). The BS program has three areas of emphasis: community-based public health emphasis, holistic health studies, and school health. Students who seek admission to the MPH program must have at least two years of full-time professional experience in a health-related field. A 44-unit cohort program, the MPH degree can be completed in five semesters, however, longer plans of study are available. The curriculum includes courses on public health policy, program evaluation, design and research, biostatistics and public health, and community health education. Founded in 1984, USF's College of Public Health was the first school of public health in Florida. On the undergraduate level, COPH offers a Bachelor of Science in Public Health and two dual degrees - BS Public Health/MPH and BS Environmental Science & Policy/MPH or MSPH. There is also a Fast Track MPH/MSPH for USF Honors students. There are five graduate degree programs available: Master in Public Health (MPH), Master of Science in Public Health (MSPH), Master of Health Administration (MHA), Doctor of Philosophy (PhD) and Doctor of Public Health (DrPH). Students can also combine their MPH, PhD or DrPH degrees from COPH with an MA or PhD degree in Anthropology, Biochemistry/Molecular Biology, Health Administration, Law, Nursing, Physical Therapy or Social Work. Old Dominion University's School of Community and Environmental Health offers a Master of Public Health degree, as well as a BS in Environmental Health, a BS in Health Sciences, an MS in Community Health and a PhD in Health Services Research. The Master of Public Health degree is offered by Old Dominion in collaboration with Eastern Virginia Medical School. Available tracks of study include health management, epidemiology, environmental health and health promotion. MPH classes are held on weekday evenings and Saturdays at both Old Dominion and Eastern Virginia Medical School campuses, and the program can be completed in two years of full-time study. ODU's Master of Public Health program is fully accredited by the Council on Education for Public Health (CEPH). The College of Education and Professional Studies at the University of Central Oklahoma offers a Bachelor of Science in Community/Public Health degree. This program is approved by the joint committee of the Society for Public Health Education (SOPHE) and the American Association for Health Education (AAHE). Students who complete the program are qualified to sit for the Certified Health Education Specialist (CHES) exam. The curriculum includes courses that cover essential topics in the public health arena such as health administration and policy, community intervention, environmental health, and health assessment and evaluation. Students are required to complete a 50-hour practicum that involves shadowing a health educator, as well as a 320-hour internship that provides them with complete immersion in the public health field. The Colorado School of Public Health (CSPH) is accredited by the Council on Education for Public Health (CEPH). Its programs are offered through the University of Colorado Denver, Colorado State University and the University of Northern Colorado. UC Denver offers both a Bachelor of Arts and a Bachelor of Science in Public Health. CSPH offers the following degree programs: Master of Public Health (MPH), Master of Science (MS), Doctor of Public Health (DrPH) and Doctor of Philosophy (PhD). Students enrolled in the MS and PhD programs can choose from the following areas of concentrations: Biostatistics, Epidemiology, and Health Services. CSPH also offers joint degrees in medicine, nursing, public administration, urban and regional planning, and veterinary medicine. Public health professionals battle to keep the world healthy. In every corner of the globe, warriors work on tackling the spread of infectious disease, improving healthcare access, reducing environmental hazards, developing government policy, creating educational programs and conducting important research. Sound exciting? We think so too. That’s why we’ve put together this quick guide to earning a public health degree. Here you’ll find detailed information about which degree to choose, what accreditations to look for and whether licensure and certification is necessary. An associate’s degree in public health is a 2-year qualification that can be used for entry-level roles in healthcare administration or as the basis for a bachelor’s degree. To give students a broad, interdisciplinary view of public health, the curriculum often includes subjects like statistics, anatomy, nutrition and community health. Associate of Applied Science (AAS) in Public Health: Intended for students who wish to start a career straight after graduation. Associate of Science (AS) in Public Health: Intended for students who are interested in earning a bachelor’s degree. An associate’s degree won’t get you very far up the job ladder, but it may qualify you to work as a health coach, health teacher, community health educator, health promotion counselor or program coordinator. A bachelor’s degree in public health is a 4-year program that provides a thorough grounding in the field. This degree can be used as a stepping stone to graduate work, preparation for a related career (e.g. law, medicine, government, etc.) or as the basis for entry- or mid-level jobs in public health. A typical curriculum has courses on science, psychology, statistics, social and behavioral sciences, health administration and epidemiology. Bachelor of Arts (BA) in Public Health: Often focuses on arts-related subjects (e.g. psychology, sociology, history, etc.) and their relation to human health (e.g. environmental health, human behavior, history of public health, etc.). Bachelor of Science (BS) in Public Health: Often focuses on science subjects (e.g. biochemistry, chemistry, biology, etc.) and their applications in the real world of human health (e.g. biostatistics, epidemiology, etc.). Before signing on the dotted line, check if your program has CEPH accreditation. Good bachelor’s degrees will also require an internship and/or fieldwork. A master’s degree in public health is a 2-year program that delves into both practice and research. Master’s degrees in public health are usually grouped in 2 categories: professional and academic. Which category you choose will depend on your career goals. Master of Public Health (MPH): Intended to prepare graduates for practical, hands-on work in public health professions. As such, most curricula include ASPPH’s 5 core competencies: biostatistics, epidemiology, social and behavioral sciences, environmental health and health policy and management. A wide variety of concentrations (e.g. community health, global health, maternal and child health, etc.) are available. Master of Health Administration (MHA): Frequently earned by professionals with jobs in hospital administration, health policy and health service management. Concentrations focus on administrative challenges (e.g. health information technology, health policy, healthcare finance, etc.). Anyone with a regionally accredited undergraduate degree can apply for the MPH. You do not have to hold a BA or BS in Public Health. Good professional degrees will arrange internships and fieldwork opportunities (e.g. working in a hospital, public health department, non-profit or government agency). Always look for MPH programs with CEPH accreditation. Master of Science in Public Health (MSPH): Geared towards students interested in further graduate work, public health research and/or public health policy. Courses may emphasize quantitative methods; concentrations cover a range of public health issues (e.g. environmental health, health policy and management, occupational health etc.). Master of Health Sciences (MHS): Often earned by students fresh out of college. Can be offered as an academic program (for students interested in further graduate work or research careers) or as a professional program (see above). Check with each school for specific details. Note: The MPH is not a clinical degree. However, some states will recognize MPH holders as ancillary clinical professionals. For example, this can happen in hospitals who have MPH public health staff. Finding it hard to choose between public health and a related passion? You have the option to combine your MPH with another master’s degree (e.g. JD, MSW, DPT, MD etc.). Some schools have developed formal dual degree programs that condense the amount of time it takes to earn both degrees. In other schools, you have the freedom to design your own curriculum. A doctoral degree in public health is a 3-5 year program that prepares graduates for the highest level of their profession. Doctorate holders pursue careers in management, university teaching, public health policy and/or deep-level research. Like the master’s degree, doctorates fall into 2 categories: professional and academic. Doctor of Public Health (DrPH): Intended for working professionals interested in practical applications such as public policy analysis, program administration and public health management. Graduates use the DrPH to advance their careers, qualify for high-level administration jobs and become leaders in public health. The MPH is a requirement. Doctor of Health Science (DHS): Emphasizes the application of scientific knowledge to clinical practice, delivery of health services and health professional education. Often earned by advanced practice clinicians, mid- to executive-level healthcare administrators and allied health professionals (e.g. physical therapist, paramedic, etc.) who hold master’s degrees. Doctor of Philosophy (PhD) in Public Health: Intended for those interested in professorships, research in national labs or advanced fieldwork. As part of the dissertation requirement, PhD students often tackle a large public health research project in the social, behavioral or biological realm. If you’re interested in public health doctorates, be sure that your program has CEPH accreditation. Certificates: Short non-degree programs (e.g. 6 months – 1 year) offered at the undergraduate and graduate level. Students often obtain certificates in order to specialize in area of interest and/or earn course credits. Always check that your credits will be transferable to your chosen degree program. Executive Degree Programs: Part-time degree programs geared towards working professionals interested in leadership positions in public health. In most cases, students must have a few years of experience in order to apply. Courses are offered at night, on the weekend and online. Summer Institutions: Highly focused summer programs that explore specific areas of public health. Some summer institutions offer academic credit. We recommend your university or college have regional accreditation. This is a “seal of approval” granted to institutions by one of six regional accrediting bodies (e.g. North Central Association of Colleges and Schools). You can learn more about the difference between national and regional accreditation in: Accreditation: Understanding the Difference Between Real Schools and Diploma Mills. You will also want to look for program accreditation from CEPH. The Council on Education for Public Health (CEPH) is an independent, nationally recognized agency that accredits schools of public health and public health programs. It assesses everything – bachelor’s, master’s and doctoral degrees; on-campus, online and hybrid. You can search for any CEPH-accredited degree, in any format, in the CEPH Degree Database. No. The U.S. does not require public health professionals to hold any license in order to deliver essential public health services. To sweeten your résumé, you may wish to earn the CPH credential, but it’s not mandatory. The Certified in Public Health (CPH) credential is purely voluntary. It demonstrates that a graduate of a CEPH-accredited school or program has mastered core competencies in public health. You can find complete information about the certification process, details about the CPH exam and answers to common FAQs on the National Board of Public Health Examiners (NBPHE) website. American Public Health Association (APHA): Publishes the American Journal of Public Health, provides professional development opportunities (including internships and fellowships) and has a great deal to say about federal policy. Association of Schools & Programs of Public Health (ASPPH): Represents all CEPH-accredited schools and programs. Its website has tons of helpful educational resources for newbies to the field. Health Resources and Services Administration (HRSA): A federal agency responsible for improving access to health care services to people who are uninsured, geographically isolated or vulnerable. Offers a variety of loans and scholarships. National Board of Public Health Examiners (NBPHE): Oversees and administers the CPH credential. Schools of Public Health Applications Services (SOPHAS): Provides a centralized application service for CEPH-accredited schools and programs. Participating schools will redirect you to SOPHAS when you apply. Society for Public Health Education (SOPHE): Independent professional organization that represents nearly 4,000 health education professionals and students. Offers a variety of awards and scholarships to members.